Chronic inflammation is linked to a number of serious diseases and health problems from various cancers, to autoimmune disorders, even Alzheimer’s . So what better way to help manage inflammation than with a delicious and tropical anti-inflammatory smoothie? This smoothie is absolutely packed with anti-inflammatory goodness with turmeric, chia seeds, pineapple, and ginger! This definitely isn’t your average green smoothie! Thanks to the fresh fruit and pineapple it has a sweet tropical flavor with a subtle warming kick from the ginger and turmeric – super unique and refreshing! If you’re looking for a more traditional green smoothie flavor instead, then you’ll love this kale mango smoothie. It is important to note that curcumin is not readily bioavailable (able to be absorbed by our bodies). By consuming curcumin with peperine (found in black pepper) the bioavailability of curcumin is increased by 2000% . Curcumin is also fat soluble which is why the coconut oil is added to this recipe. Chia seeds are one of my favorite ways to boost my green smoothies! It’s common knowledge that ginger is great for digestion, but did you know it also has anti-inflammatory properties? Thanks to a phenolic compound called 6-Gingerol, ginger is a powerful anti-inflammatory food. Ginger is also super versatile, it’s good in everything from smoothies to stir fry. I even put it in my detox waters! 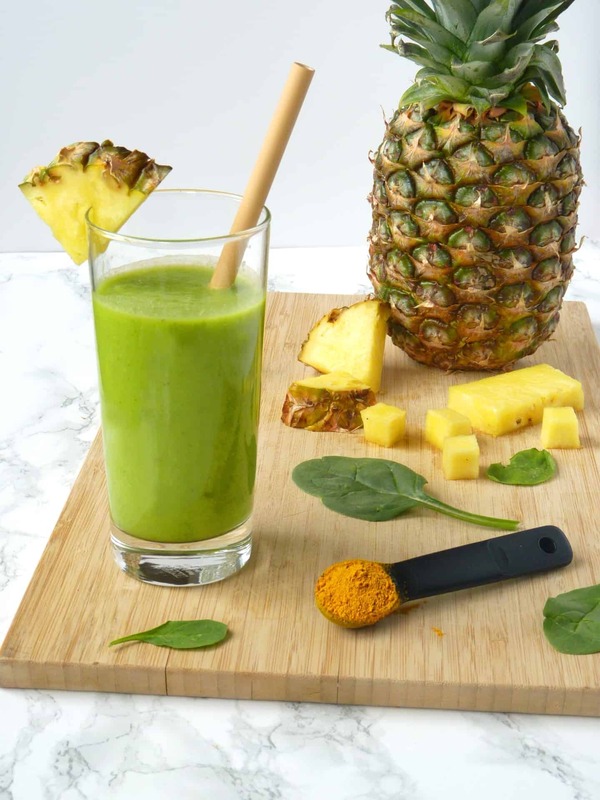 To make this powerful pineapple turmeric anti-inflammatory smoothie, start by preparing the fruit and peeling the ginger. If you have a high quality blender you can simply add all the ingredients and blend to your desired consistency. Otherwise, you’ll want to blend the spinach with the almond milk until well combined first. This makes it easier to break down the spinach so you aren’t chewing it while drinking your smoothie! The crushed black pepper seems like a strange ingredient in a smoothie but it is such a small amount that you can’t taste it at all. Its only purpose is to increase the absorption of the good stuff in the turmeric as discussed earlier. That’s it, your done. Just add a slice of pineapple to your cup and enjoy the refreshing tropical flavors with powerful anti-inflammatory benefits! This isn’t your average green smoothie! Thanks to the fresh fruit and pineapple it has a sweet tropical flavor with a subtle warming kick from the ginger and turmeric – so unique and refreshing! This smoothie is also packed with anti-inflammatory goodness from the turmeric to the chia seeds to the pineapple. I use a protein brand called Gainful. They create a personalized protein blend for your specific needs whether that’s weight loss, muscle gain, recovery or more. They also cater to a variety of dietary needs like vegan, gluten-free, keto, and various allergies. You can find out which protein blend is the perfect fit for you by taking the protein quiz! Really good for my arthritis thank you!!! How many calories is one serving ? One serving is about 225 calories. Cheers! We have been encouraged to leave the core in the pineapple as it has really good anti inflammatory properties. The pineapple core has been measured to have higher levels of Bromelain which is the anti inflammatory compound in pineapple. The core doesn’t have as much flavor and is much harder, but if you have a high speed blender that can fully break it down then it’s definitely worth leaving in!